Natural Black Seed Henna Shampoo 8oz. Our shampoo is said to be one of the best shampoos on the market! Sweet Sunnah Hair Care formulas are a balanced mixture of Black Seed oil and plant extracts that have been carefully selected to complement one another. The first step in putting your hair back on the road to health is finding a natural and nourishing cleanser. 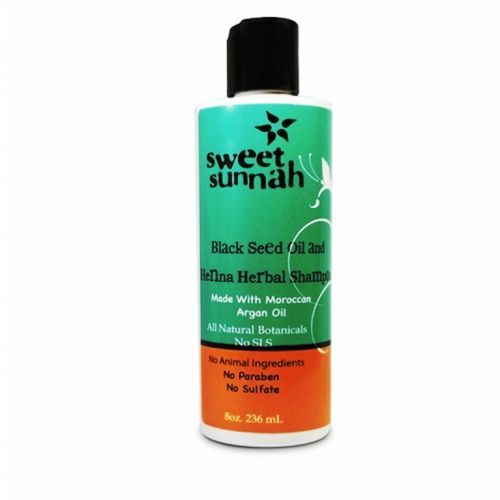 Our Black Seed Oil and Henna Herbal Shampoo is the perfect choice. Our shampoo is super-enriched with vitamins, minerals, proteins and herbs. Our wonderful moisturizing shampoo is made with all natural organic ingredients and pure essential oils that leave the hair clean and lightly conditioned without over stripping it. It cleanses deeply and brightens hair by removing all the impurities that make your hair look and feel drab. Bring new vitality to your hair with our organic and nourishing formula. Repairs damaged hair (split ends) and helps slow down hair loss .Roots are reinforced and the hair structure is improved and becomes stronger. Black Seed oil ,Wheat Proteins, Pro vitamin B5 and other plant extracts strengthen the hair shaft while Henna and Rosemary extracts condition the scalp, adding gloss and fullness to hair. Restores softness and shine to dry undernourished hair. Suitable for all hair types and safe for very sensitive skin and permed or color-treated hair. No Sodium Lauryl or Laureth Sulfates! Water, Cetearyl Alcohol, Cetyl Alcohol, Stearalkonium Chloride, PPG-3 Benzyl Ether Myristate, Myristyl Myristate, Quarternium - 91, Phenoxyethanol, Cetrimonium Methosulfate, Hydroxypropyl Guar Panthhenol, Fragrance, Argania Spinosa Kernal Oil, Disodium EDTA, Ethylhexylglycerin, Black Seed Oil ( Nigella sativa), Pogostemon Cablin Oil, Tocopheryl Acetate, Aloe Barbadensis Leaf Juice.